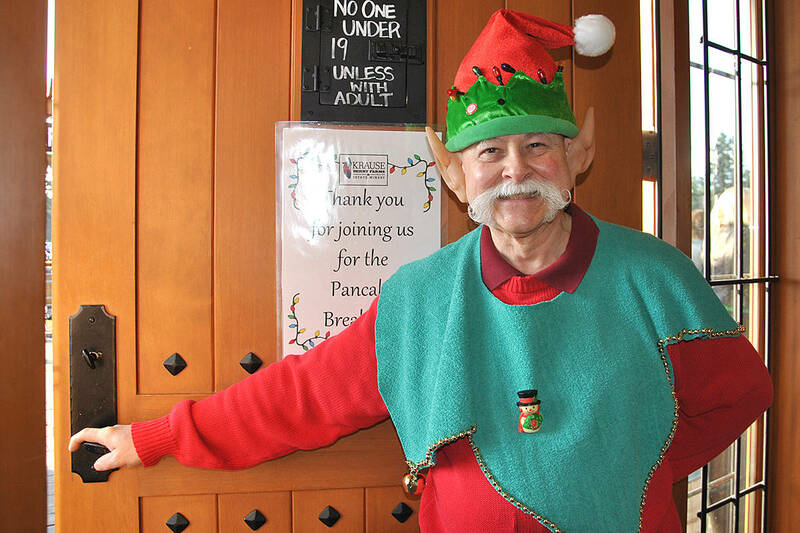 The 14th annual Krause Berry Farm breakfast with Santa raised almost $4,700. Dec. 11, 2017 1:20 p.m.
Two hours just wasn’t enough time to push through the hundreds and hundreds of pancake lovers who converged on Krause Berry Farms Sunday morning. 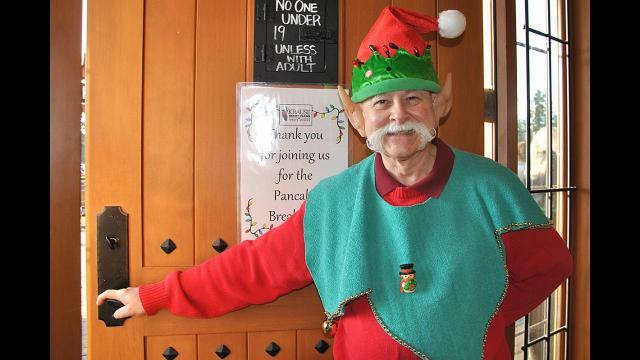 For the 14th year running, Alf and Sandee Krause hosted a fundraising breakfast with Santa and weather is partly to blame or credit for the huge crowd that turned out, said Sandee, scanning the crowd and smiling. “This is our 14th year flipping pancakes in memory of Liz Krause,” Sandee explained. Liz is Alf’s late wife, who passed away in the late 1990s of breast cancer. This year’s Christmas breakfast raised $4,683.40 for the cause – bringing the total since 2003 to more than $45,000. For Sandee, she’s just so excited to see families of all sizes, young and old, “spending time together knowing many were remembering someone dear to them,” she said. Staff and volunteers were once again key to the success of the fundraiser, interjected Alf, who said one of highlights in the day for him was seeing the eagerness on the staff and volunteers faces as they prepared for the guests to arrive. Then, going to open the gate a half an hour early, he said he was floored to see 80 some cars full of people waiting to come in and support the event. Throngs of people just kept coming for hours and hours. The crowds of supporters didn’t actually start dissipating until well into the mid-afternoon. One family of four sent Krauses a thank you letter the same day as the event. “All the staff and volunteers I encountered maintained their Christmas cheer, despite the crowd they had to contend with. A really well done event for a very good cause,” noted Ian, Cary, Isabel, and Isaac.